After a blog reader recommended the book Etched in Sand by Regina Calcaterra, I looked around to see if I could find it available for free. Happily Hoopla had it. I started listening immediately. So many of the books like this I don’t want to say “I enjoyed them”. I don’t want to say it “was a good book”. BUT it was all of those things…Instead I think it’s better if I say the story had me thinking and empathizing with the kids. I could say I wanted to keep listening even though the story was painful as I SO hoped something good would happen for these children. It is so hard for me to believe there are people out there who abuse their children and neglect them. More frustrating for me than all of that is that the system is just that…a system that doesn’t always make sense. 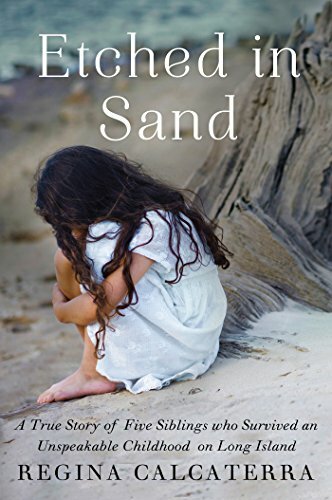 Here’s what Amazon had to say:“Regina’s Calcaterra memoir, Etched in Sand, is an inspiring and triumphant coming-of-age story of tenacity and hope. Regina Calcaterra is a successful lawyer, New York State official, and activist. Her painful early life, however, was quite different. Regina and her four siblings survived an abusive and painful childhood only to find themselves faced with the challenges of the foster-care system and intermittent homelessness in the shadows of Manhattan and the Hamptons. Amazon readers give the book 4.7 stars. I’m going to agree. I do wish I could ask the author a couple questions…like did Norm get abused? Did she ever talk to her dad? I recommend the book and thank the blog reader, Sue , who suggested it to me. I appreciate suggestions.